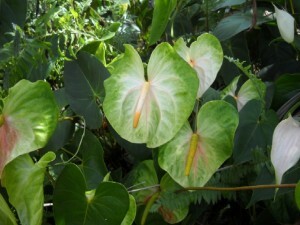 Mauna Loa Anthurium Flowers are obake anthuriums that are white and green. They tend to be white in the center and green at the edges. Mature plants can produce extra large flowers. The Mauna Loa’s mother plant was a Tropic Ice, but we don’t know who the father anthurium plant was as the Tropic Ice was open pollinated. What this means is that the pollination didn’t occur under controlled conditions, so no one knows exactly which plant produced the pollen that fertilized the Tropic Ice and fathered in the Mauna Loa. It is a great variety for growers because it is blight tolerant and anthracnose resistant and it is also a favorite of people who like cut flowers as it can last up to 56 days in a vase when freshly cut. And even after being dry packed for three days it can still last 39 days in a vase. The Mauna Loa Anthurium was named after Mauna Loa, which is the second tallest of the five volcanoes that make up the Big Island. It is also the largest volcano in the world when measured by volume. Translated from Hawaiian to English, its name means “Long Mountain.” It is an active volcano that last erupted in 1984. The city of Hilo, which is the most populated city on the Big Island, is built upon its slopes, so any eruption of Mauna Loa poses great danger to the city.